Some Russian experts are of the opinion that the upcoming international conference on Syria indicates that the U.S. and EU want to distance themselves from the Syrian conflict, as it is clearly becoming a burden to them. The opponents of Syrian President Bashar al-Assad are clearly not united. That much has been demonstrated by the preparations for the international conference on Syria and the debate on the issue of arming the Syrian opposition. On Monday, May 27, the foreign ministers of Russia and the United States met in Paris for the latest round of talks on their joint initiative: the second international conference on Syria. The conference — informally referred to as “Geneva 2” — will be analogous to last year's gathering, which adopted the basic principles for a settlement in Syria. Back then, the U.S., Russia and other participants agreed on the need to set up a transitional governing body, on the basis of a joint accord between the Syrian government and the opposition, to oversee the country's transformation in a manner agreeable to all Syrians. Judging by the words of Russian Foreign Minister Sergei Lavrov, the participants in Geneva 2 (and therefore its aims) have yet to be clarified — even the date and venue have not been fixed. The minister of foreign affairs under Bashar al-Assad has already announced that Damascus is ready to take part in Geneva 2. However, there is no clarity on the part of the opposition. The National Coalition of Syrian Revolutionary and Opposition Forces (NCSRO) has been in Istanbul for talks since May 23, in an effort to frame its position regarding participation in the international conference on Syria and to diversify (and, to some extent, secularize) the forces within its ranks. However, when Lavrov and Kerry met in Paris, only eight of the 25 new members of the opposition coalition had been elected, demonstrating once again the friction that exists within this highly eclectic body. The meeting of opposition leaders was initially slated to conclude on May 26, but had to be extended for another three days. Whether that will be long enough remains unclear. Without a responsible delegation to represent the Syrian opposition, the whole enterprise makes little sense. Moreover, the opposition does not appear to be striving for peace. After a meeting with U.S. Sen. John McCain (R), the commander of the Free Syrian Army, Salim Idris, told information website The Daily Beast: "We want the U.S. government to support the Syrian revolution with arms and ammunition, and anti-tank and anti-aircraft missiles. And, of course," he added, "we want a no-fly zone." 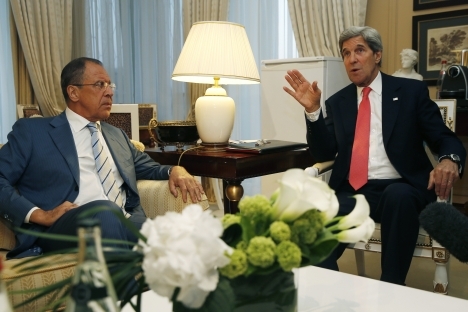 “We have a common understanding of the need to avoid steps that could thwart the conference,” Lavrov said. But it seems that such understanding is beyond the EU. Just a few hours after meeting Lavrov and Kerry, EU foreign ministers decided not to extend the arms embargo on Syria. That decision makes it possible to supply arms to the opposition on a bilateral basis. The initiators of this latest "Black Spot" against Bashar al-Assad were France and Britain. However, not all European countries supported the move. Belgium, for example, has no intention of supplying weapons to the Syrian rebels when the embargo expires, announced Foreign Minister Didier Reynders. "We have decided not to supply arms to Syria, because we have no guarantee that they will fall into the right hands — i.e. the moderate opposition, who will target the extremists," said Reynders. "Moreover, there is a risk that weapons in the region will proliferate," he added. Italian Foreign Minister Emma Bonino was also disappointed by the decision of her EU colleagues, saying that it does Europe no credit. "It is not so much the content of the agreement that is disheartening, rather the attempt to nationalize some of the competencies," she said. The same tone was struck by the Czech Republic and Austria. But these countries have no need to worry about saving face when the soft-pedaling begins, which could happen in the course of Geneva 2. Many in the West are already fed up with the Syrian conflict, believes Leonid Isaev, a Middle East expert at Moscow’s Higher School of Economics. The conflict has been ongoing for two years: It began as a dead end, and so it remains. And that state of affairs is unlikely to change as a result of the meeting. The West, by agreeing to another conference on Syria, "wants to show — including to its partners in the Arab world and Turkey — that it is no longer interested in nourishing the conflict by financial or other means," said Isaev. The conference, in the expert’s view, "should demonstrate that Europe and the U.S. want to distance themselves from the Syrian conflict, because it is clearly becoming a burden to them."